An accelerator for which plugs into the CPU socket. The solder points are from the tower which sits into the 68000 socket and provides it with enough clearance to sit even above a rom switcher cable. There is no provision for inserting the 68000 onto the accelerator as a fallback mode unlike most other accelerators which use the CPU socket. The Sapphire 020 works in ALL of the standard Amiga models, A1000, A500, A2000 (and subsets of that, i.e. A2000HD). The Sapphire 020 was the 'poor' man's accelerator card offering anywhere from 10%-40% speed increases depending on what was running or being used. Additionally, it brought the ability for the Amiga's to use the 68881/2 math co-processors as well which made a big difference in number crunching. One of the not so well known facts is that NASA used the Sapphire in the shuttle program as did FASA in the first Battletech Center virtual Battlmech Cockpits. 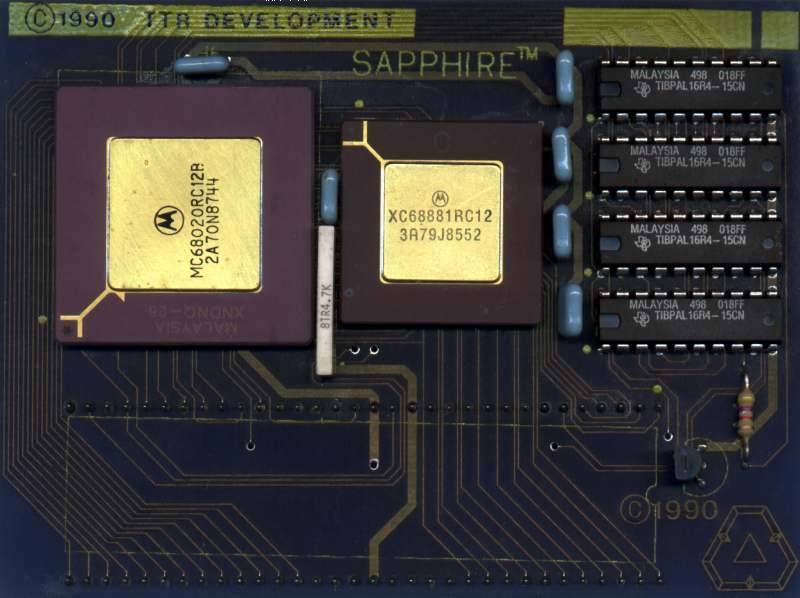 The design of the Sapphire 020 showed it to be one of the most compatible of all accelerator cards of the day. Where the 'big boys' had numerous problems with software compatibility, we have very very few which was a huge selling point back then. When people ordered the card they had to let us know WHICH unit it was for because we had different models for each Amiga. In essence they same board but for the A500, we produced and included a extender board that moved the card over 1" and up about 3/4" for clearance. If the person just ordered the base Sapphire, that one was designed to just plug into the A1000 as is but for the A500 or A2000 the other model with the built in extender board was needed. Page contributors: Ron Mascaro, Todd B.